There are some toys that you remember getting or having, and then there are others that are definitive. They aren’t just Christmas or birthday presents, they are in introduction to a lifestyle. 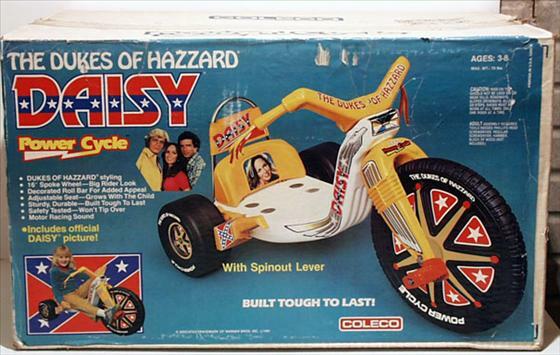 For those of us born in the Seventies or Eighties, that toy was Big Wheels. A modified tricycle that allowed the rider to sit low and tended to move faster, therefore adding more to the everyday life of the average kid, the Big Wheel ride-on toy was created by Louis Marx and Company in 1969 and became very popular among both kids and parents, at least according to Wikipedia’s entry, which notes that its plastic construction and low center of gravity made it less expensive and safer than the classic tricycle. Big Wheels was actually the trademark of Louis Marx & Co, but wound up becoming the generic name for the toy, and through the 1970s, they sold in huge numbers. Having been born in 1977, I am a part of the second wave of the Big Wheels generation. Those older than I was probably didn’t have much to choose from when it came to their big wheel experience, as evidenced by the Big Wheels that had been procured by and donated to my nursery school. They’d let us out onto the playground each day and we would go right for a shed in the back that held several Big Wheels. Some were in better condition than others–the blue and yellow ones were relatively new, which meant they were also the most desirable, and the purple ones were slightly used and therefore second tier. Those blue ones became so coveted, in fact, that at one point, our teachers had to designate beforehand who got to use them. By the time I was old enough to have my own Big Wheels, at the age of five, the makers of Big Wheels (mainly Empire Pastics, who made Big Wheel competitor Power Cycle; as well as Coleco, a company more known for a video game console than a kids’ ride-on toy) had figured out that there was money to be made from licensing. Now, everyone who grew up in the Eighties will remember that the ultimate in licensed Big Wheels was the Knight Rider Big Wheels that was made to look like KITT, but the one that I owned had to run a close second to KITT, which was the General Lee. I had been a fan of three prime time television shows when I was five years old. One was The Greatest American Hero, one was ChiPs, and the third was the Dukes of Hazzard. Granted, I got to watch all of half a season before the Coy and Vance era began, but I don’t think I noticed that considering I was paying more attention to the stunts and car chases and I still really liked the show. I liked it so much, in fact, that when I received the General Lee Big Wheels that Christmas, it was the most awesome thing ever. How could you not like an orange and black Big Wheels with ribbons on the handlebars, stars on the wheels, and a compartment where you could store things? And just as it was when I was on the nursery school playground, my big wheel was the center of my outside time at home right up until I was old enough to begin riding a bike, which is what I got for Christmas about a year or two later. And it’s kind of funny when you think of it because you tend to think that certain toys just dominate your childhood for an exceptionally long time but when you do the math, it really only ads up to a year or two, tops. Then again, such is being a kid, especially a kid in the Eighties who seemed to be into a new thing every year. Besides, unlike the tricycle I received for my third birthday, which was made of metal and was heavy and rather unwieldy, the General Lee was made entirely of plastic and not built to last longer than the year or two I would spend riding it around. The ribbons fell off quickly, the wheels began to crack and just as I started riding that bike on a regular basis, the Big Wheels went into my parents’ garage where it would have remained until an adolescent toy purge had my friend Evan and I not discovered it in the third grade. … or perhaps it was a desire to do something completely reckless. When we found the General Lee and my sister’s Cabbage Patch Kids Big Wheels, we almost instantly got the idea to turn a simple plastic tricycle ride down the block into Death Race 2000, bumping one another off the sidewalk and into the grass as well as flying headlong into one another using classic demolition derby-type maneuvers. We knew that the Big Wheels weren’t going to last very long as a result, but hearing the cracking and grinding of plastic followed by the sound of victory yelps as the winner of the race made a left turn into the driveway, we really didn’t care. I don’t think my parents cared either, to be honest. We were playing outside and those Big Wheels were destined for the dump anyway, so if our beating them up hastened their journey towards that trash heap, so much the better. But for the time that I spent riding my General Lee Big Wheels, whether it be when I was a little kid cruising the sidewalk or a bigger kid trying to run my friend off the road, I kind of knew what it was like to be cool. 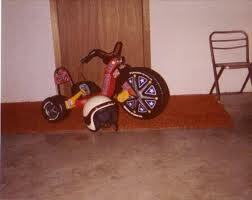 I was born in 1980 so even though I had seen Big Wheels at friend’s house I never owned one. I was way into the Dukes of Hazzard as a kid. One story from when I was a kid told by my parents was. During the show I would be sitting in front of the TV while my younger brother in his crib would throw his bottle at me at which time I would give it back. After getting annoyed by my brother throwing the bottle during my show I finally took the bottle and kept it from him. Anyway I was just going though your site after hearing about it on several podcasts I listen to and also discovering In Country podcast though your promos.